I really, really like David Housewright’s whodunits focusing on St. Paul cop-turned unlicensed private eye Rushmore McKenzie. The character is a likeable mix of charm, guile and toughness seasoned with a dry wit and keen perception whose first-person narratives of his cases are so addictive Housewright makes me come back for more each time. In this, the fifth book in a series that began with A Hard Ticket Home, big trouble strikes the family of McKenzie's lifelong friend Bobby Dunston when Bobbys daughter Victoria is kidnapped. And apparently, the kidnapper knows both Bobby and Mac from somewhere in the past. He also knows that Mac is rich after capturing a millionaire embezzler years before, and that McKenzie is the one who has to pay the million dollar ransom the kidnapper demands for Victoria’s return. Mac antes up the ransom readily, but not before he, Bobby, and the FBI find out just who the kidnapper is. He even says goodbye to the perp by name as he spirits Victoria away upon her release. That very afternoon, however, the suspect is found dead in the very spot Mac made the trade for Victoria. And that night, the first of many attempts on Mac's life begin as if it were open season, and Mac is the game. Housewright, a native Twin Citian, knows his town in and out, and gives this knowledge to Mac. Who explains to the reader just what, say, Block E in Minneapolis is and why it is there when Mac goes to meet an informer of his named Chopper at a club located there. It is downright cool to read something so noir-ish set in the Twin Cities, a place one normally would not associate with such fiction. 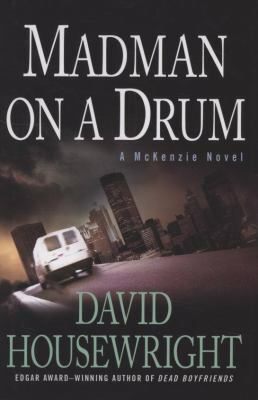 In short, Madman on a Drum is as impossible to put down as all the McKenzie novels that came before and after it.